Averi also LOVES her fruits and vegetables. She will snack on berries, mandarin oranges, tomatoes, mushrooms, bell peppers, green beans, snow peas, carrots and more. She loves cooked broccoli and raw spinach. BUT, Averi is still a little picky in that she won’t eat just any piece of produce. It has to be PERFECT. No bruises, no mushiness, not a single speck of brown on it. For the most part this is easy to accommodate, although I do end up freezing a lot of bananas. And Michael ends up eating a lot of half eaten apples that have turned a little brown before she finishes them. 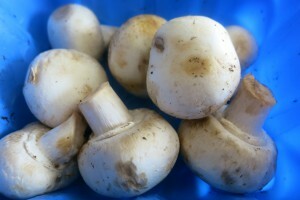 But I was wasting a lot of mushrooms. They turn brown fast! And since Averi eats them raw, I wasn’t always able to cook them in order use them. Then one day I was chatting with my friends Kim and Ceci. They mentioned that you can peel mushrooms. Peel mushrooms! I had no idea this was an option. But it’s fantastic. Once you peel off the brown, sometimes slimy outer skin, the inside is smooth and beautiful, and gets Averi’s seal of approval as being worthy of eating. 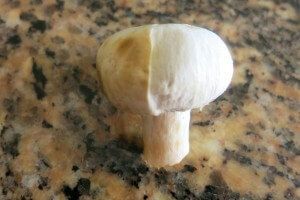 So don’t throw out mushrooms that look icky. Just peel them and enjoy! Turn upside, so stem is upright. 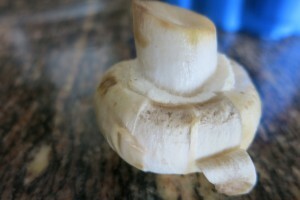 Hold stem, and where cap starts, lightly place fingernail into cap to loosen the skin. Then peel off the thin outside layer, till all removed.